Welcome to London! The city of British royal family, the Queen’s Guard with their signature bright red coats and Napoleonic France-bearskins, red double-decker buses, afternoon teas, classic cabs and strict unwritten rules when it comes to forming a queue. At first glance, London presents itself as a unique mixture of old and new traditions. The uninterrupted flow of charming architecture of old times gets distorted by the touches of modernism in the form of occasional new buildings, modern cafes and shops that make it impossible not to fall in love with the city. Moreover, this is the place where Sherlock Holmes accompanied by his assistant and dear friend Dr. Watson solved many great mysteries of that time, and Beatles wired for success gave their early performances at pubs and nightclubs. 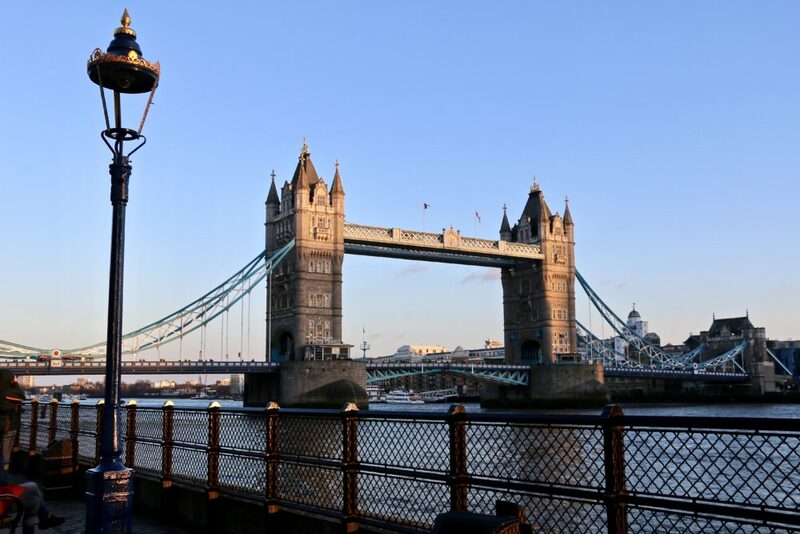 Isn’t it the city that you want to explore as soon as your airplane lands in London Heathrow International Airport? 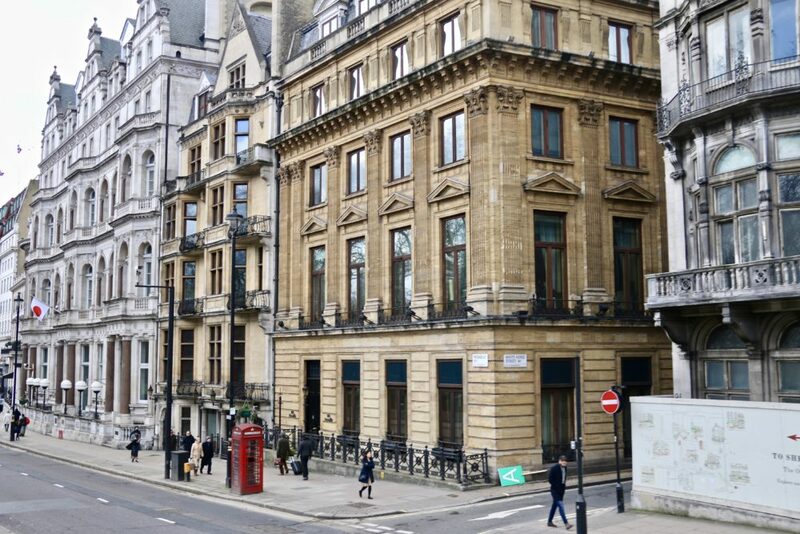 To enhance our London experience and make the sightseeing as pleasant as possible, we decided to book a guided tour. After considering several options, we stopped on Original London Sightseeing Tour: Hop-on Hop-off, which turned out to be a winner in all categories. Along with narrated commentary, the tour gives you flexibility to travel on three main tour routes and discover the highlights of the city at your own pace (you get off the double-decker bus at the location of your choice and get on the next bus when you are ready to more on to the next destination on your itinerary). 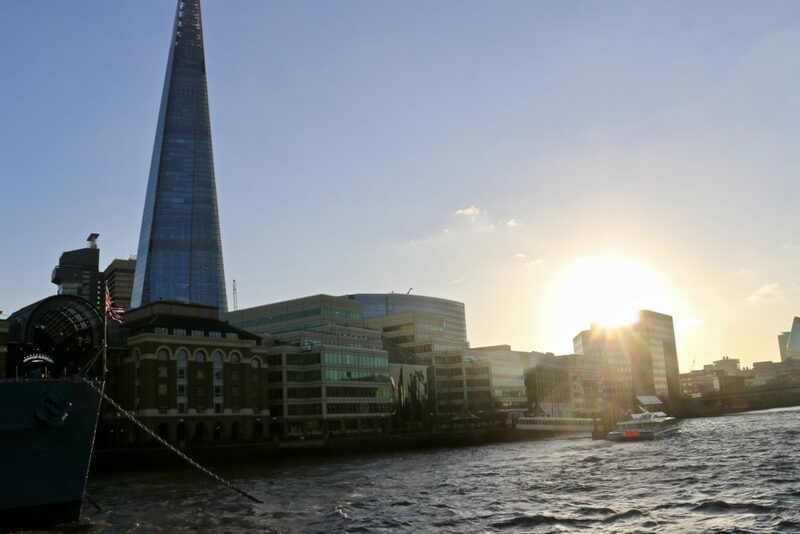 As a bonus, using your Hop-on Hop-off ticket, you have a pleasure to discover London from a deck of a Thames River sightseeing cruise boat or take part in three city walking tours. Let’s stop here and hop on that London tour bus. We started our adventure at Piccadilly Circus. Located at intersection of five main roads, the place has become one of the busiest and most popular destinations in the city. 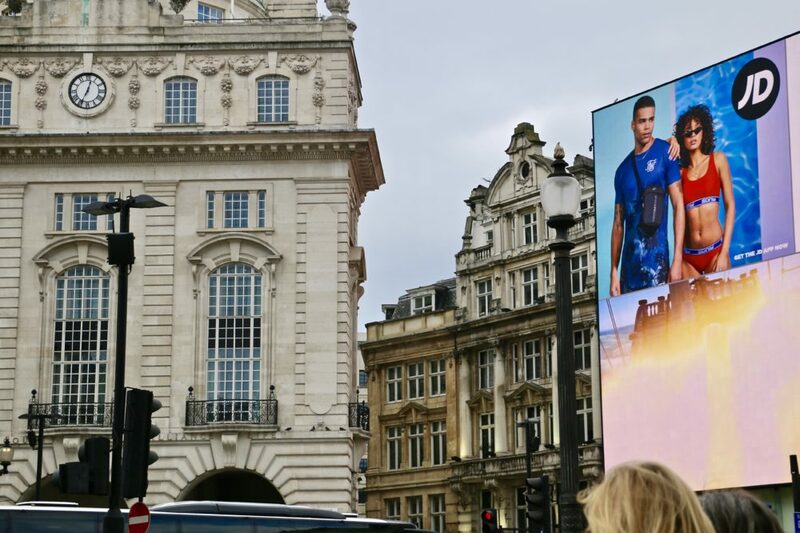 Thanks to big neon advertising billboards, it is often called mini Time Square of London. 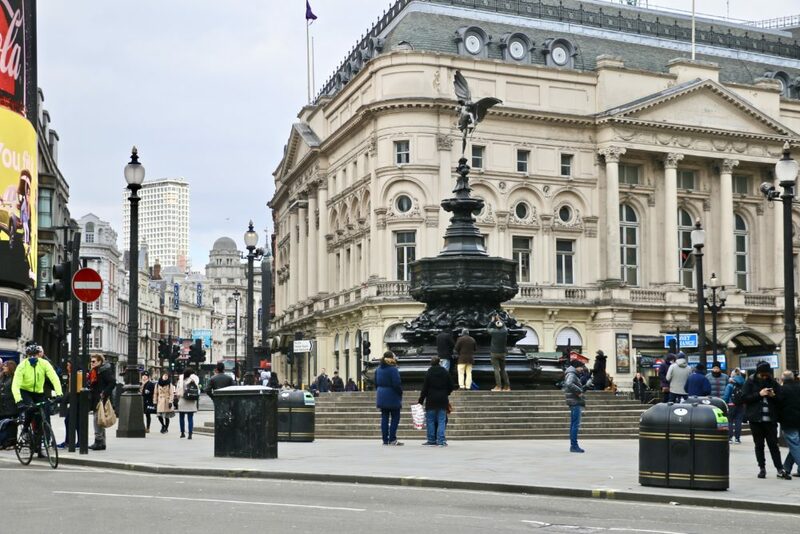 Other famous attractions include the Shaftesbury Memorial Fountain, which mostly referred to as the Statue of Eros, the London Pavilion and Criterion Theatre. Admiring the capital of England from our tour bus for about 15 minutes, we hopped off at our next destination, Trafalgar Square. 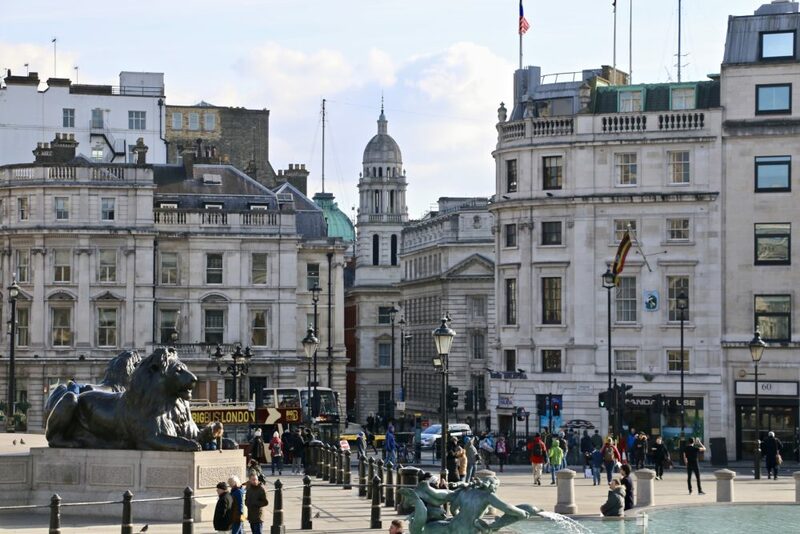 Named after the Battle of Trafalgar, the square is home to Nelson’s Column, the well-known Fourth Plinth and four Landseer Lions zealously guarding the column. On the north side of the square, the National Gallery opens its door for the visitors to explore over 2000 exhibits originated in Western Europe. After grubbing a bite at one of many cafes near Trafalgar Square, take a short walk of approximately 10-15 minutes to Big Ben, London’s most famous landmark. 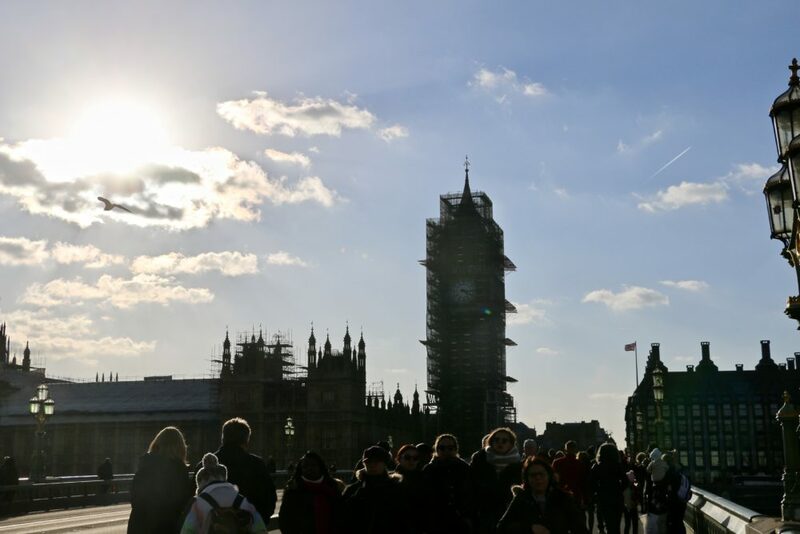 Located in the Elizabeth Tower at the north end of the Houses of Parliament, the prominent tower clock is known for its accuracy and massive bell. 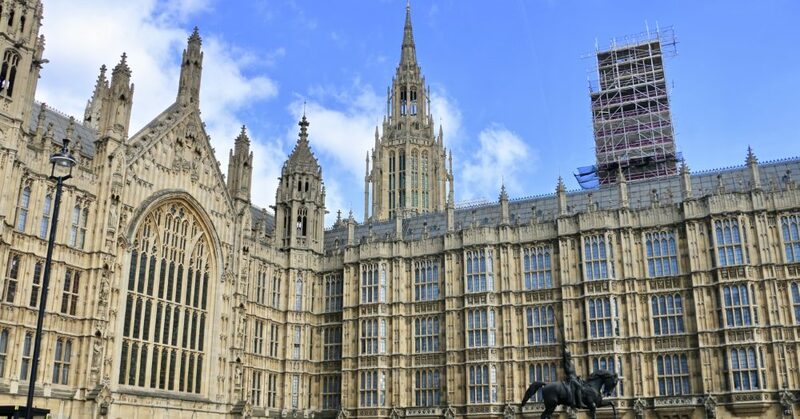 Unfortunately, public tours to the tower are not available unless you are a resident of the United Kingdom who in written form reached out to the Members of Parliament with a request to schedule a private tour. 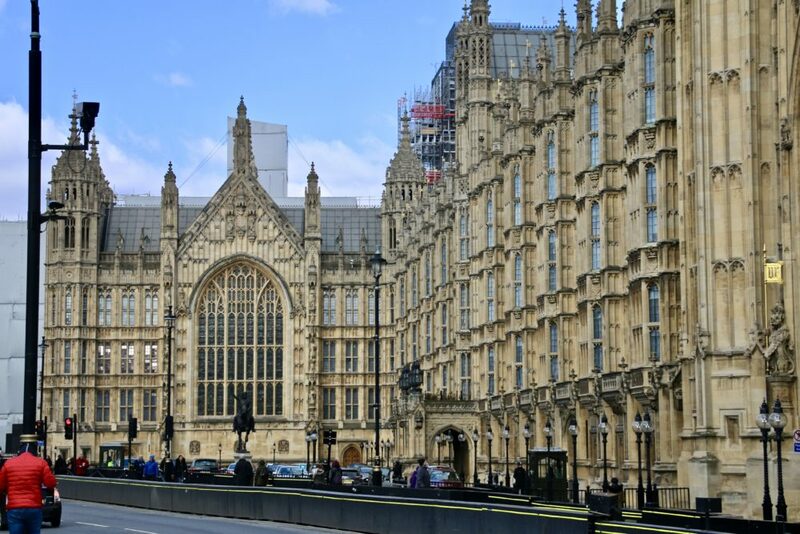 Located on the north bank of the River Thames, the Palace of Westminster, commonly known as the Houses of Parliament, is the place where two houses of Parliament come together to discuss current issues and make laws. Unlike Big Ben, the Palace of Westminster offers the public tours to the residents and foreigners alike. 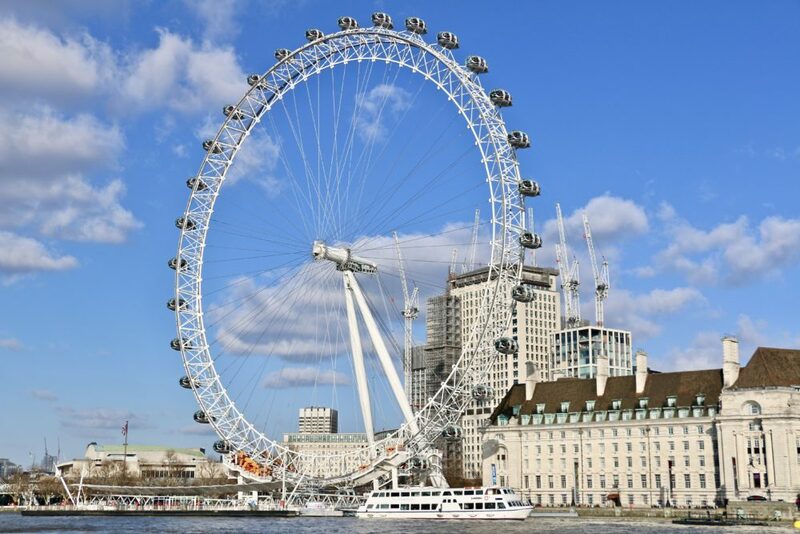 Not far from the Palace of Westminster on the south bank of the river, London Eye, the newest attraction of the city, invites the visitors to take a look at the capital from 443 feet above the ground. Slowly moving colossal observation wheel makes a full turn in about 30 minutes while rewarding its guests with a 360 degrees view over London including such landmarks as Buckingham Palace, the Houses of Parliament and St. Paul’s Cathedral. Visit to London without walking across London Bridge, one of the most famous and oldest bridges in the world, will not be complete. 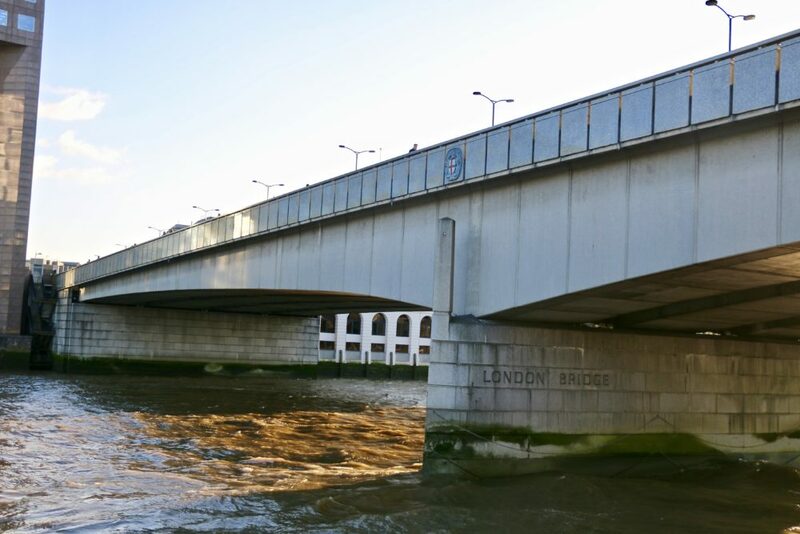 Interestingly, throughout its long history, this crossing over the river was replace with several new bridges, all called London Bridge. The current bridge abundantly portrayed in movies, magazines and newspapers was installed in 1973. Without exaggeration, Tower Bridge is one of London’s most beautiful bridges. This is also by far one of the most photographed bridges in the world. Walking across this historical bridge with its two Gothic Revival bridge towers can easily become the highlight of your London visit. But do not stop just there, get inside the marvelous structure to learn about its history, visit engine room and observe the river traffic from a walkway with glass floor situated 131 feet above the river. How can you talk about the bridges without first mentioning the reason for their need? The second longest river in the United Kingdom, the River Thames is an integral part of London and London’s lifestyle. Traditionally, numerous art galleries, museums, attractions, pubs and restaurant have been clustered around the river attracting the visitors from all over the world. 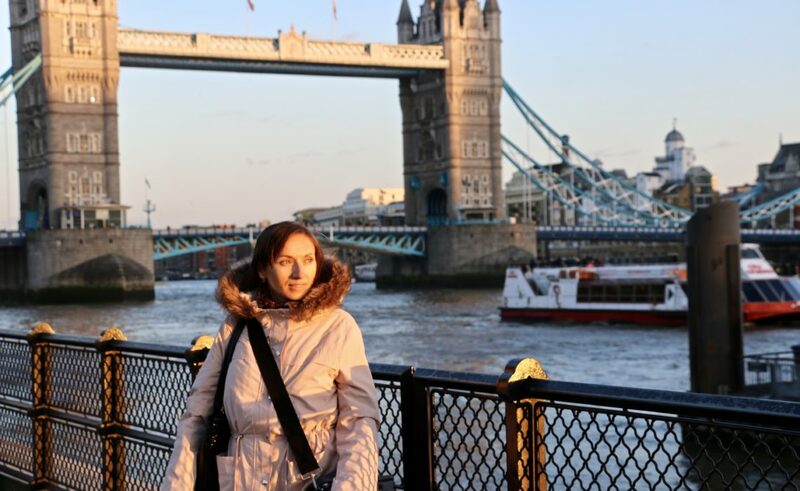 If time permits, make sure to take a sightseeing river tour or enjoy a leisurely stroll along the river including crossing over London’s many bridges. 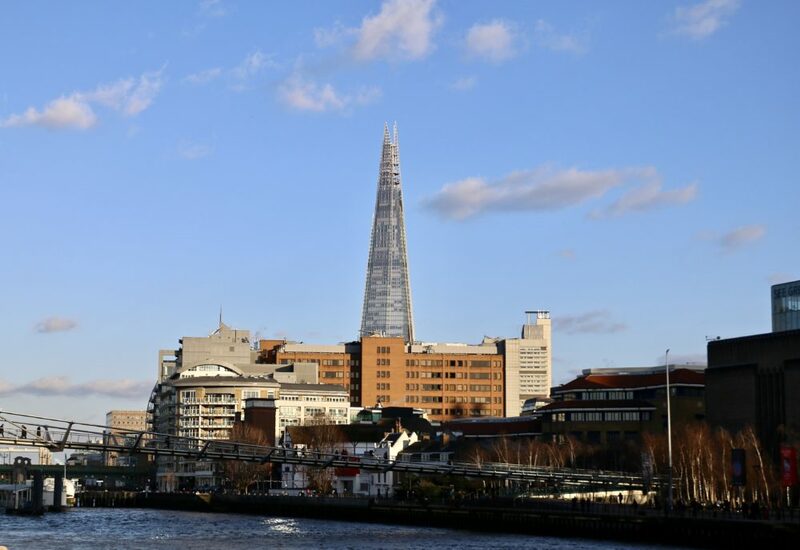 For a spectacular view over the city, head to the Shard, a glass skyscraper located just moments from London Bridge. From the 72nd floor of the tallest building in Western Europe, you will have a chance to marvel at the capital of the United Kingdom and enjoy the view for over 40 miles. However, if clouds spoil your experience, you are more than welcome to come back for free. 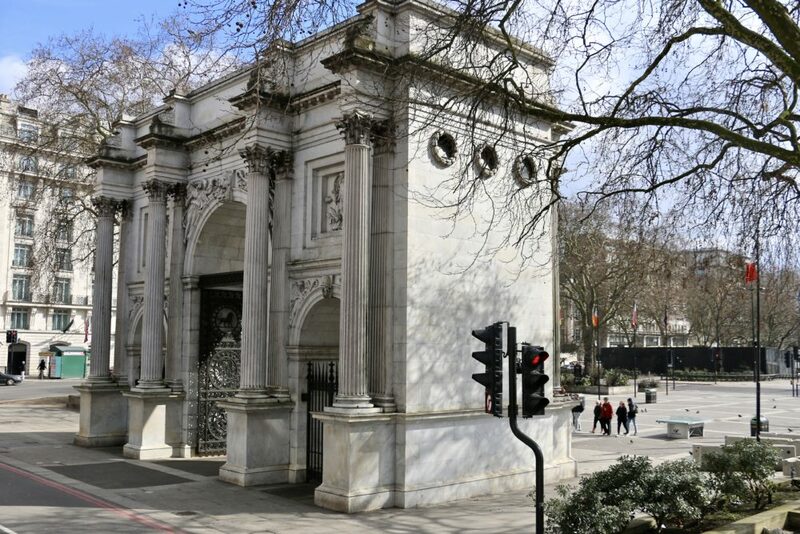 Lastly but not lease, stop at Hyde Park, the largest of royal parks in London, and observe its ample memorials and monuments. Famous for its long history as a place where majority of protests took place, up to this day the park holds all sort of marches and demonstrations. Visit Speaker’ Corner of the park on a Sunday morning to hear people from all walk of life express their views. 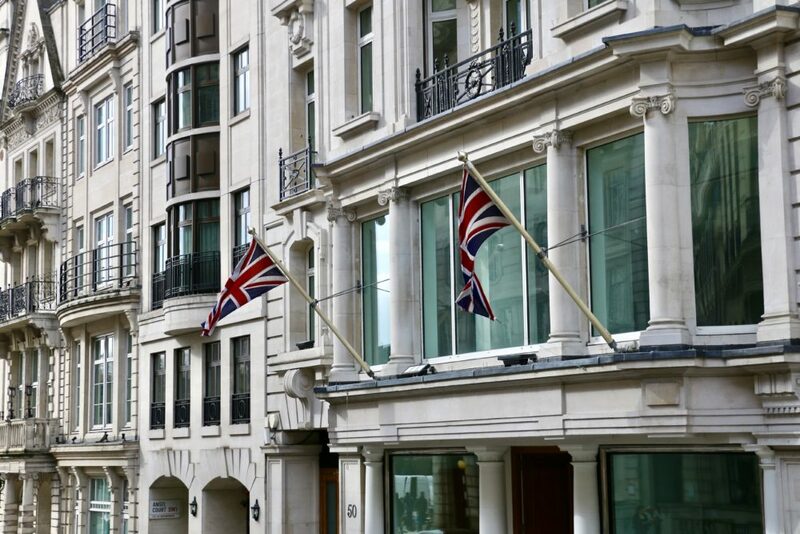 After all these sightseeing activities, with a feeling of accomplishment you can hop off the bus to pursue your other London goals or stay right there on the classic double-decker bus and enjoy another round of all top attractions of the city.